A top Chinese official has claimed several high-ranking members of the Communist Party had plotted to seize power from President Xi Jinping. These party members have since been arrested or jailed in a wide-reaching corruption crackdown launched by Mr Xi. Some observers have said the crackdown was used to conduct a political purge of Mr Xi's opponents. The latest claim of a power struggle appears to contradict the Communist Party's unified image. On Thursday, the chief of China's securities commissions, Liu Shiyu, listed names of six "high-ranking and powerful officials, who were hugely greedy and hugely corrupt, and who plotted to usurp the party's leadership and seize state power". Mr Liu's list included top names whose downfalls have attracted intense scrutiny, such as former security chief Zhou Yongkang, prominent politician Bo Xilai, and Sun Zhengcai, a member of the decision-making Politburo body who was only recently expelled. The other names were former presidential aide Ling Jihua, the late army general Xu Caihou, and former top military officer Guo Boxiong. "These cases were definitely shocking," said Mr Liu, who was speaking at a panel for the ongoing Communist Party congress in Beijing. It was unclear whether he was referring to one co-ordinated plot or separate attempts at a coup. Mr Liu said that Mr Xi had "addressed these problems, and eliminated a huge and hidden danger to the party and the country". More than one million officials have been jailed or arrested in the corruption crackdown which began shortly after Mr Xi took power in 2012. The depth of the crackdown has led many to speculate that some arrests were politically motivated and that part of Mr Xi's overall strategy was to consolidate power. 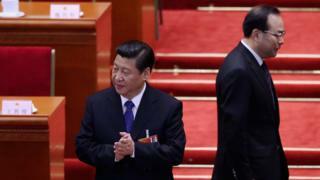 Mr Xi had previously denied claims there was a "power struggle" within the party. But the comments appear to corroborate what has long been suspected - that there are intense power struggles going on behind the party's image of unity, says the BBC's Michael Bristow. 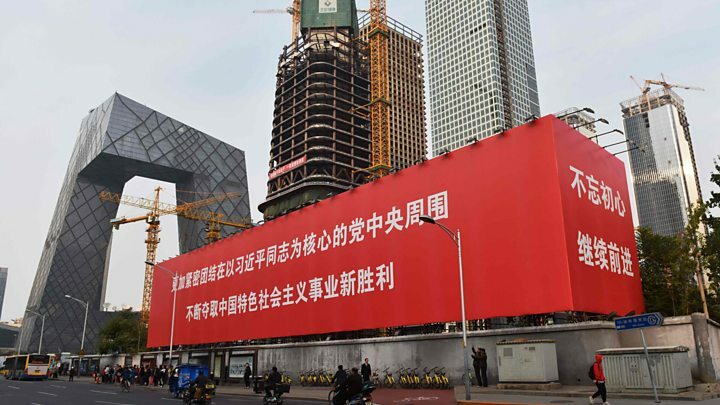 The claim comes as Mr Xi created his own political ideology, in the latest move to entrench his position in the Communist Party. The party is widely expected to rewrite its constitution to enshrine this theory before congress ends next week.